La Plagne positions itself as a resort, focused on a rich family outdoor vacation. With 255 km of trails, La Plagne attracts a record number of visitors every season. Located at an altitude between 1250 and 3250 meters, the resort includes a glacier where experienced skiers can test their strength on unprepared routes. The resort is highly regarded by advanced skiers: 73% of guests ride on red and black tracks, but you can explore the entire ski area by navigating along the blue trails. In winter, in addition to skiing, guests can take routes for ski tours, adapted for any level. They pass through the untouched infrastructure of the resort and return to the prepared routes. The ski resort La Plagne is located in the valley of Haute Tarentaise, almost in the center of the French Alps. It can be called a resort of world importance since it was here in 1992 that the stages of the Winter Olympics were held. One of the attractions of La Plagne is the bobsleigh track, the only one in France. The resort was established in 1961, and since 2003, together with neighboring Les Arcs and Peisey-Vallandry, it forms the second in the world after the famous Three Valleys ski area ParadiSki. La Plagne unites 12 villages, each of them can offer you beautiful hotels, discos, restaurants, and bars. Plagne Center - the first of the settlements, was built in the 1960's. Most of the shops and entertainment are waiting for you right here. Belle Plagne is convenient for the location of the ski area. Plagne 1800, Plagne Bellecote, Plagne Village, Aime la Plagne and Plagne Soleil also have a good location. These seven villages are connected by roads and lifts. The remaining five villages are located below, they are well suited for families with children because next to them there are excellent trails for the training of small skiers. La Plagne is famous for its favorable ecology. The French Alps can be called a miracle of nature, therefore they must be preserved in the present form. Environmental experts carefully monitor the construction of new facilities. Automobile traffic on the territory of the resort is prohibited, the car will have to be left in a special parking. The base price of your ski transfer will be minimal and most profitable. We never overstate prices for our customers. In order to save money, we advise you to book a transfer in the middle of the week, or after the high season. On weekdays Alps2Alpas make a transfer discount up to 60%. The price of your transfer will also be dependant on such list of factors as availability and utilization of the vehicle, transfer schedule and some other costs as the toll roads and parking charges in the airport. If you are going to travel in a large group and you have any additional requirements, don’t doubt to contact us so we can directly discuss all your needs. In La Plagne, there are practically no problems with the snow cover, since the trails mainly pass along the northern slopes at an altitude of more than 2000 meters. Well, if the snow is not enough, snow cannons begin to work. La Plagne is characterized by a ramified network of lifts and wide straight descents. It is the ideal place for athletes with average experience, most routes are designed for them. For children, there are also many suitable trails, as well as special lifts (and free) and experienced instructors. La Plagne is known all over the world as a family resort, however, it means that there is no active apres - discotheques, spa centers, restaurants, swimming pools, ice rink. 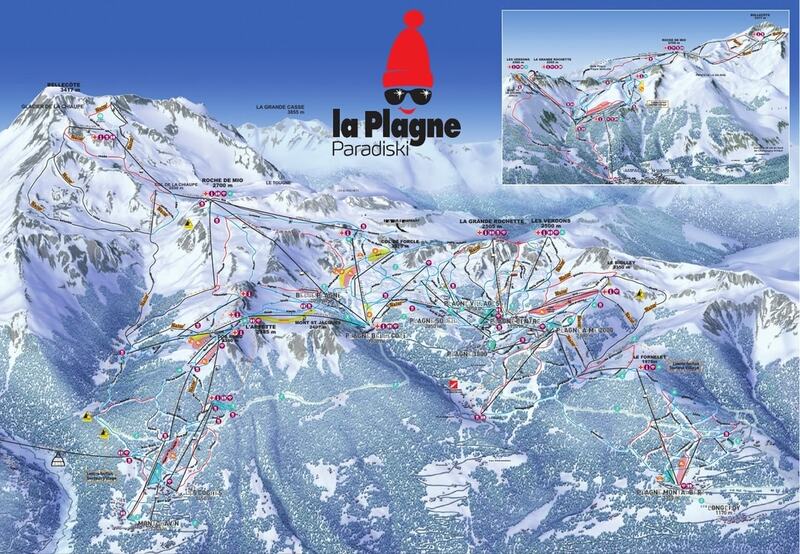 The Tourist Office of La Plagne every week offers an updated, rich program. The resort has 13 ski and snowboard schools, in which more than 500 instructors will teach both adults and children. Also, there is a kindergarten. We always recommend you to book your transfer to La Plagne resort ahead of time, in order to get the most economy of money. If you’re ready to start, simply give a call to our customer care team. The best way to begin your trip to La Plagne is to book the best transfer to this wonderful resort in Alps2Alps.